LAS VEGAS (AP) — Killian Tillie scored 22 points and No. 6 Gonzaga raced away to its sixth straight West Coast Conference title with a 74-54 victory over BYU on Tuesday night. 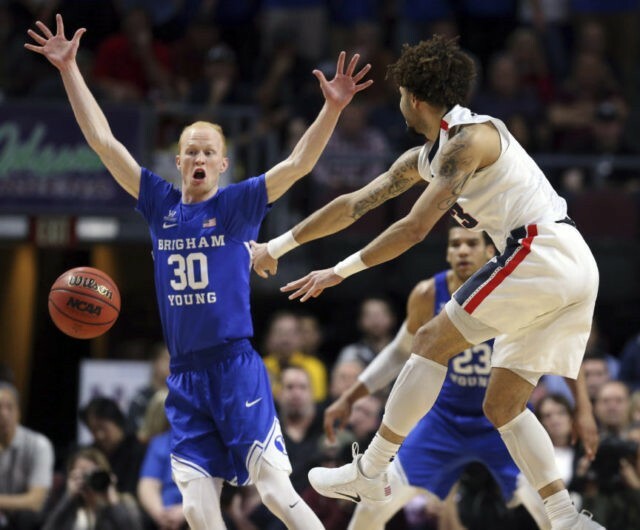 Gonzaga (30-4) appeared as if it would lock into a defensive battle with BYU (24-10). The Zags turned it into a title-game rout with a halftime-spanning 36-6 run to win their 17th WCC title. Zach Norvell Jr. had 17 points and the Bulldogs held BYU to 35 percent shooting to win their 17th straight conference tournament game. The dominant title performance should boost Gonzaga’s chances for a high NCAA Tournament seed in what could be its last go-round in the WCC. The Bulldogs are in talks about joining the Mountain West Conference, possibly next season. Gonzaga continued its surge to open the second half, holding BYU without a field goal the opening 5 minutes while going on another 11-1 run. The Zags kept pouring it on, pushing the lead to 57-31. BYU could end up in one of the smaller postseason tournaments.